As I've mentioned before, I am rather picky about pizza and have had an awful time finding decent pizza up here in New Hampshire. (I'm from Connecticut. Italian food is done well there. I'm spoiled.) For the past few months I've been talking to the folks behind Crush Pizza on Twitter and looking at their pictures of example pizzas and letting myself hope. So, of course, I had to go check it out on opening night earlier this week, and . . . The Quick Take: Oh my goodness! Real pizza! In New Hampshire! This is amazing! I'm so excited! I shall become a regular! Some details . . . The Ambience: Nothing breathtaking, but it's perfectly pleasant and a nice use of the space. There are a good number of tables, but it doesn't feel crowded, and it's barely recognizable as a converted Quiznos. There are Italian-themed prints on the walls, and the music was a decent classic rock mix. The Menu: You can view it here (PDF). The focus is definitely the pizza, but there's a broad (though shallow) range of salads, appetizers, wings, steak tips, grilled meat entrees, sandwiches, and desserts. 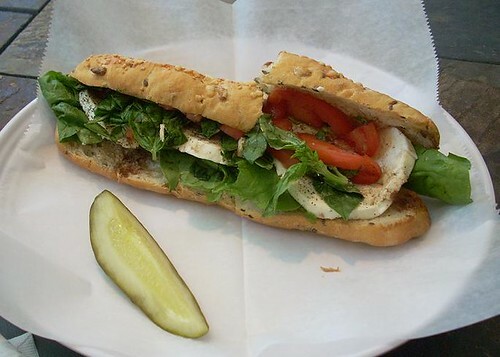 There's lots of meat AND plenty of options for vegetarians, which is always helpful. The Salad: I had a caprese salad, and it was fine - pretty standard. The tomatoes were a little cold, but it was otherwise good. The cheese was high-quality and I liked that it came with a decent-sized clump of spring mix on the side. 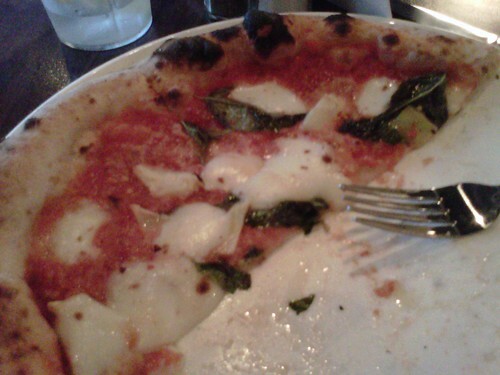 The Pizza: I got the margherita pizza with added artichokes (pictured above). The crust was great - thin and properly charred, and char is hard to find up here. The sauce tasted fresh, and not too sweet as pizza sauce often is. The mozzarella was good, although I did wish there was a little more of it. The artichokes went with the rest well, and I was thrilled to find artichokes as a standard option. The pizzas are all one size - what you see in the picture is half of it - and they're designed to be one serving, though I ate two of the four pieces and took the other half home. The Dessert: I tried the panna cotta. It was a little more berry-intensive than I expected - there was some sort of berry compote covering the top - but delicious! Drinks: There were no beverages on the menu, and for now they seemed to have Pepsi-brand fountain beverages as well as cappuccino and espresso. (I just had water.) They're promising a full wine list and selection of craft beers in the future, so I'll update this post if they have those options next time I'm there. Reheating: An often-overlooked but important aspect! I took half my pizza home and reheated it in the toaster (never put pizza in the microwave!) the next evening. While it wasn't as good as it was straight out of the oven, of course, it reheated well, retaining its structural integrity without becoming stiff. And it was definitely still tasty! The Service: There was the normal opening-night roughness, of course, but the staff was very friendly and attentive. And even though I was eating alone and reading, they didn't rush me - always a plus. The Verdict: Overall, this was a great experience and I am definitely planning to make Crush my new default pizza place. They're at 449 Amherst St. in Nashua, NH. In addition to dining in, they offer takeout and promise online ordering soon. I was ridiculously excited to discover that an all-macaroni-and-cheese restaurant had come to Manchester, since I love a) macaroni and cheese, b) restaurants with unusual concepts, and c) restaurants with a variety of vegetarian options. From the online menu, you can see that there might not be as many vegetarian options as you'd expect, actually, but the "create your own" section basically takes care of this, at least for me. I had a "create your own" with mozzarella and cheddar cheese, artichoke hearts, and tomatoes, and it was delicious. (My dining companion liked his Chicken Bacon Ranch as well.) The service was fine and the restaurant itself was pleasant enough, if not particularly aesthetically pleasing. I'd like them to have a few more options for sauces - salsa would be good, for example. And their take-out packaging could use some more thought. But overall, I was quite pleased with the visit, and I'll definitely be going back. I'd be even more thrilled if I lived in their delivery area, because isn't the prospect of custom-made mac and cheese delivered to your door at the end of a long day basically the best thing ever? It was delicious, if I do say so myself. And really, I'm not taking much credit: the recipe was from the Holiday Baking special issue of Cook's Illustrated and, as they always know what they're doing, I just followed instructions. 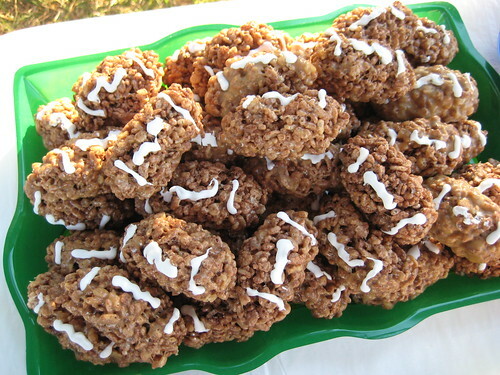 Recipe from Cooks Illustrated Holiday Baking issue. It smells divine. That's what I've been doing this morning. Today is my Friday, and I'm off to Connecticut tonight and then New York tomorrow! I'll try to set up a few posts for the weekend in advance, but we'll see how it goes. Britain's whole "number one single at Christmas" thing is adorable and quaint, but this John Cage contender is awesome. Yes, Gibbs was making West Wing jokes yesterday. Blue Valentine: No longer NC-17. The RSS reader summary of this straightforward Times item about Oprah picking Dickens for her book club read, in its entirety, "The author is not expected to appear on her show." Christine O'Donnell is just . . . I don't know. There are no words. If you only read one piece on Elizabeth Edwards, make it this one by Ezra Klein. So there was another part of that conversation with my mother yesterday that I didn't tell you about. (Well, okay, there were several parts, but I assume you don't want to hear about the intense discussion of when we're going to put up the Christmas tree. Will I tell you about that eventually anyway? Probably.) But as soon as she answered the phone, I told Mom that I had made a life-changing discovery that afternoon. She was skeptical, as you might imagine. But not for long . 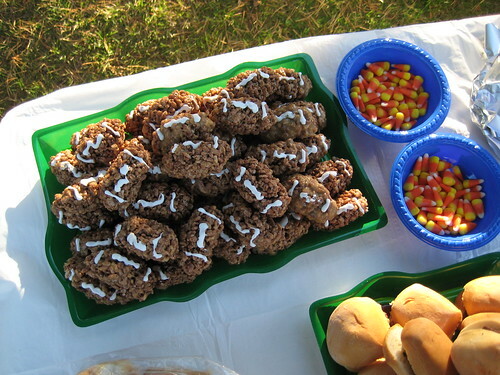 . .
As I mentioned yesterday, we do a tailgate/potluck thing after my brother's football games, and I generally bring a dessert. This is partly because I like making desserts and partly because most desserts are conveniently meatless to start with, so I run no risk of inflicting my Weird Vegetarian Food on unsuspecting football players. Early this season, I was hunting around for a new recipe to try, and I came across this chocolate-covered Chex mix. It's really simple to make and pretty basic, but everyone loved it, and I've ended up making it almost every week. (Also: now planning on sending tins of it as Christmas gifts, so let me know if you want to be on my gift list.) It's simple, that is, except for one thing: The recipe calls for unwrapping and then chopping a bag of caramels. Have you ever chopped caramels? They're, uh, sticky. That's kind of the point. Chopping them is not any fun. At all. I've realized that in order to get through it, I need either really good music to sing along to or a very patient friend who is willing to amuse me via Skype. They are also, it turns out, somewhat difficult to find. The grocery store doesn't have them. Walmart usually has them . . . until, this week, they didn't. After I failed to find them during a Walmart run at lunch on Thursday, I started making a list of other places to try. During this process, I started trying to explain to someone exactly what sort of caramels I needed, so I went to the Kraft site, and there I discovered the life-changing thing . . . 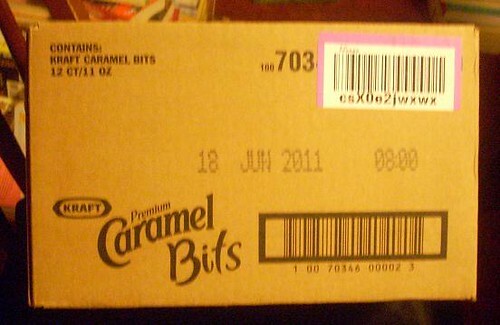 They now make CARAMEL BITS. They are a) already unwrapped and b) really little, so do not require chopping. So they would basically cut the preparation time of the whole thing by at least 2/3, if not 3/4. And it was the most annoying section that would be gone. Amazing. Of course, I had never seen these magical items in a store, but a clever friend suggested that I check Amazon. They had them - but you couldn't just buy a bag. You had to buy a 12-pack. On the one hand, buying 12 eleven-ounce bags of caramels seemed insane. On the other hand, I make this a lot, and I was REALLY sick of unwrapping and chopping. Not to mention how I was not looking forward to driving all over creation trying to find the regular ones in a store. So . . . I ordered them. Of course I ordered them. 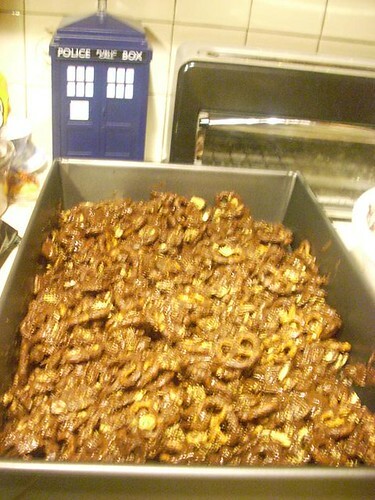 Now, this all happened Thursday afternoon, and I needed them today, Friday, to make Chex mix for Saturday. So not only did I order a case of caramels from Amazon, but I overnighted a case of caramels from Amazon. It's pretty awesome living in the future, huh? I have Amazon Prime, so overnight shipping was only $4. Amazing. When I got home, I called my mom, and once I described the whole situation and the unwrapped, small caramels, she said "Oh. You weren't joking. That is a life-changing discovery." We take our desserts seriously, as you can see. 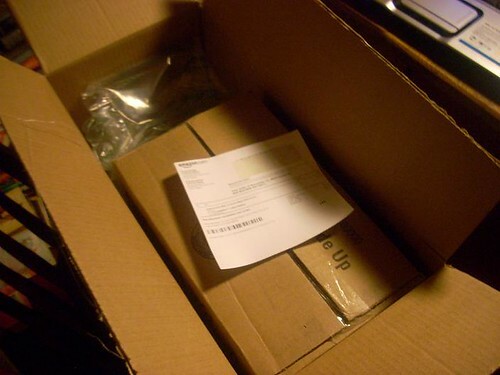 That box was, in fact, a case, packed up by the folks at Kraft themselves. 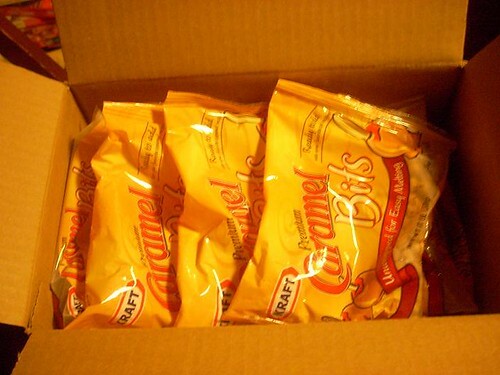 So when I was joking about ordering a case of caramels . . . it really wasn't a joke. I know you can only see about five bags there, but I promise, there are twelve. 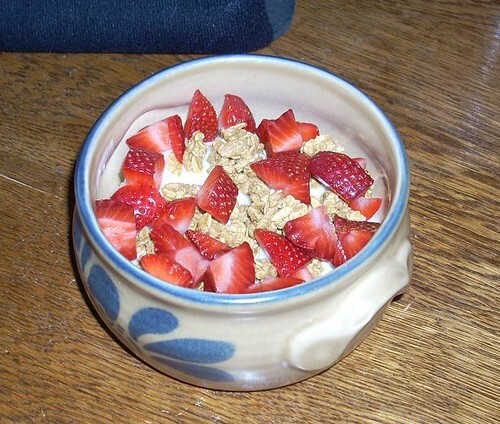 I promise I'll get a decent picture of it for you tomorrow, posed in its cute football-shaped bowl and everything. If I can get a picture before it gets eaten. Stay tuned. One of my favorite birthday gifts was a TARDIS cookie jar. (Thanks, Jack and Caitlin!) I tried to take a picture of mine but it came out poorly, so I will send you over to ThinkGeek to admire it. Anyway, I obviously needed to make it some cookies. I didn't want tons, because I live alone and I wasn't really feeling up to making dozens to bring in to work or whatever. 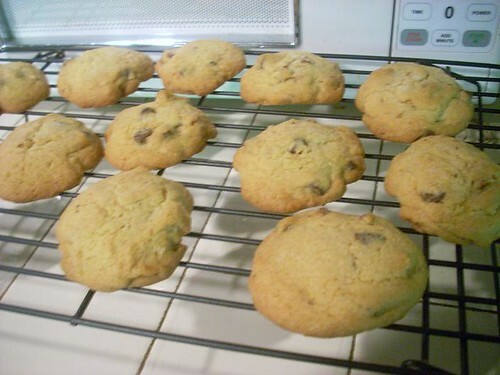 So I adapted a family recipe to make a dozen big cookies, plus a little extra dough for eating raw. 1. Preheat oven to 350. 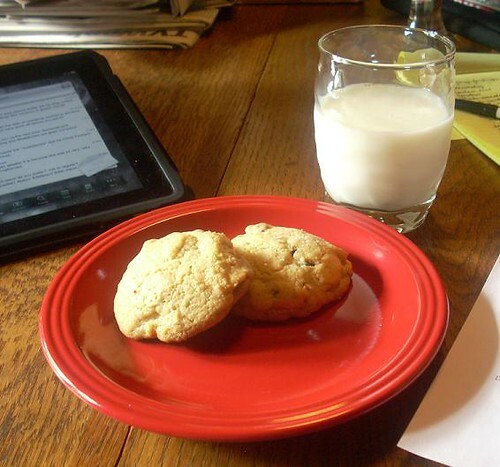 Cover a cookie sheet with a piece of parchment paper. 3. 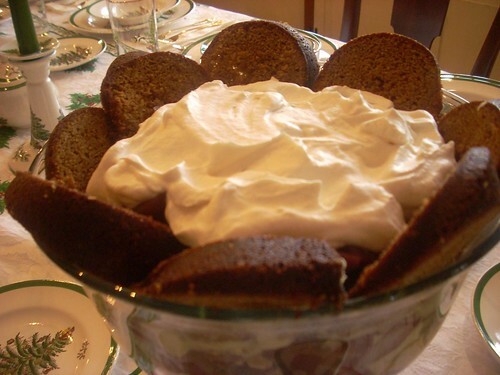 Mix in dry ingredients, then vanilla and egg. 6. Bake at 350 for about 15 minutes, or until light brown (or however cooked you like them). I've loved Friendly's for as long as I can remember. I have great memories of going there as a small child with my family. And after band concerts in high school. And to escape campus for a little while in the small town where I went to college. And, in fact, for my mother's birthday just last year, and many many other times in between. Friendly's grilled cheese is one of my ultimate comfort foods, and it isn't Christmas without their peppermint stick ice cream. 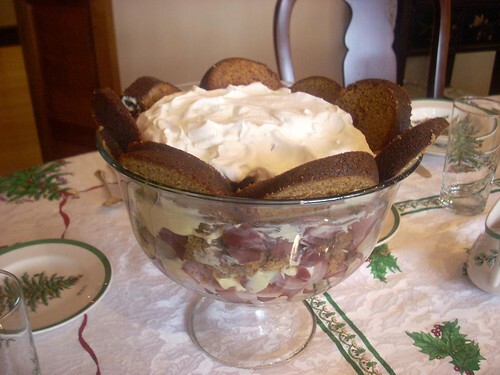 (Let's not discuss Christmas Eve 2008, when I drove around Connecticut looking for enough of that for my mom to make her amazing brownie/ice cream cake.) It's safe to say that I'm generally a Friendly's fan. But the past few years, I've been disappointed with their lack of vegetarian options. I mean, yes, I adore their grilled cheese beyond all reason, but it's nice to have a choice. Last fall sometime, Friendly's had a Q&A on Twitter with their CEO, and I was not the only one to bring up this issue. They promised they were working on it. A little while later, they asked for veggie burger brand suggestions. A few days ago, I went to a local Friendly's, and there it was! A little note had appeared on the menu saying that they would substitute Boca burgers in any of the burger dishes. I tried the Zesty Queso Burger Melt (cheese, jalapenos, tortilla strips, on sourdough) and it was great. It's nice to see a company listen to its customers' requests and make concrete steps toward filling them. 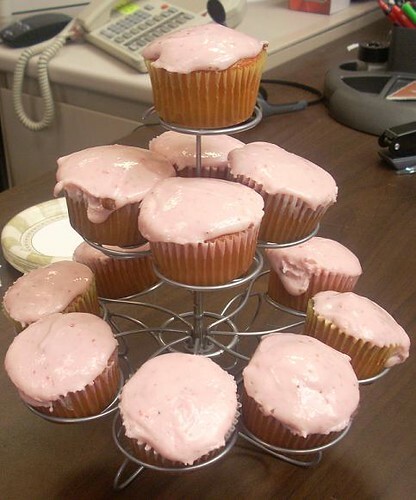 Some of my colleagues were a bit surprised that I'd brought a cupcake tree to the office, but if you're going to serve cupcakes, you might as well serve cupcakes, right? 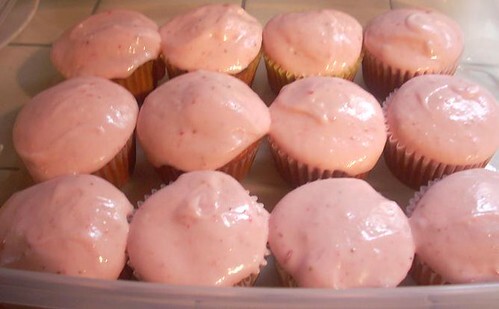 I was mixing up some strawberry cupcakes yesterday and noticed that everything was very . . . pink. 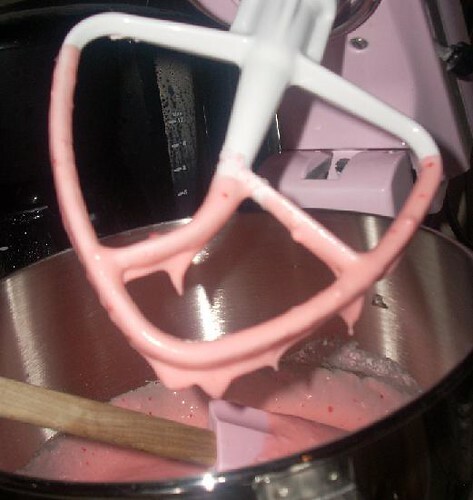 Pink batter, pink mixer, pink spatula. Hee! As long as the frosting process goes well, I'll have a picture of the finished product for you tomorrow. I can't believe I'm drinking this stuff. Confession: This summer, I've gotten hooked on SoBe Lifewater. I'd always avoided Vitamin Water and all those things. Paying extra for water that claims to be healthier never made much sense to me. But I realized that that wasn't really the point, at least for me. The issue is that I usually drink a lot of tea of various sorts, and when it's hot out, I need a replacement. Juice and lemonade tend to have a lot of sugar. I drink a lot of plain water but it gets boring. Enter Lifewater. It really tastes good! Like juice, but without the calories! (As long as you make sure to buy the 0-calorie flavors.) I've been ignoring the supposed health benefits of the different types (Forti-Fight! Purify! Whatever.) and just going by flavor. So far, my favorites are Strawberry Dragonfruit, Strawberry Apricot, and Black and Blue Berry (although that sounds kind of . . . bruised). It seems pretty easy to find them on sale for $1 or less, and the bottles are pretty big. And yes, I realized this is probably not news to any of you, as I am very late jumping on the flavored water train, but I was impressed by these and figured it was worth mentioning. I don't know who decided that it's National Doughnut Day, but hey, I'll go with it. Dunkin' Donuts is offering a free doughnut today when you purchase a beverage. It looks like Krispy Kreme is doing something too, and - are there other big doughnut chains? I don't even know, because Dunkin' Donuts has such a monopoly around here. If you're anywhere near Fairfield, Maine, though, I highly suggest that you forget about the free stuff and go pay full price for the best doughnuts in the world at the Kennebec Cafe. Really. You won't be sorry. (Do I have any readers in that area? Probably not. Oh well.) I'd read that Atlantic piece about it and then convinced my parents to give the place a try when we were in nearby Waterville, where my brother goes to school. We were all very impressed. There's sometimes a wait, but it's worth it, as your doughnuts arrive still warm. Heaven. Robinson himself was never involved with the chicken chain, but Temple's song and dance partner Arthur Treacher licensed his name and acted as spokesman for Arthur Treacher's Fish and Chips, which is now part of Nathan's Famous. There's probably something to be said about the connection between the cultural appropriation involved in being a fast food symbol and the way Temple's handlers deliberately paired her with older men they thought would make her look smaller and cuter, but I have to go to work, so I'll leave it at - hey! Interesting trend there! Last week, I kept thinking about that fresh kind of salsa that you get at Mexican restaurants, but I didn't actually want to go to a restaurant. And I'd been craving cilantro for days because of that article that was going around. The jarred Newman's Own stuff I had just wasn't cutting it, so I decided to see what I could find the the refrigerated section of the grocery store. What I found: Santa Barbara salsa. This stuff is amazing. I got the Medium under the "Fresh Salsas and Dips" heading. (The site won't let me link you right there.) I was slightly disappointed that my store didn't have Hot, but this was almost hot enough as it was, honestly. The tomatoes and onions taste fresh, the peppers and spices blend well, and you can really taste the cilantro. Perfect. I was worried that fresh salsa would have to be used within a few days, but the label says this is fine for four weeks after opening (in the fridge, of course), and there's no way it's going to last that long here - I'll probably eat it in a week. Note: This is also kosher and gluten-free. And delicious. If I didn't mention that. So! Last weekend, I finally found good pizza. It's not great, but it's acceptable. Unlike all other pizza I've found in this godforsaken state, it at least tastes like real pizza. The winner? Sal's. It's a chain, even! (I've only tried the Merrimack location so far.) But it's good! The cheese was high-quality. The sauce was neither too sweet nor undercooked, as so many sauces are. The crust was thin but not cracker-like. ALSO, they sell it by the "slice," but a "slice" in fact seems to be two rather large slices, which meant I got two meals out of it for about $3.50. And it's only a few miles from my house. This is potentially a dangerous discovery. Let's get something straight: A vegetarian is someone who doesn't eat meat. It's not someone who loves vegetables. Or dislikes composed meals. Or thinks food doesn't benefit from seasoning, and saucing, and a variety of textures and grains and cooking methods. Actually, the kitchen was doing a grilled vegetable plate. He hoped that was alright. It wasn't. The grilled vegetable plate -- or the GVP -- is so lazy as to be legitimately offensive. That meal cost actual money. Was pasta really too difficult of a charge? A sandwich? Frittata? Stir fry? Gazpacho? Stew? Curries? Pizza? Salad? Bruschetta? Dumplings? Vegetarians of the world need to stop accepting the GVP. It's an insult, both from the kitchen to the diner, and from the kitchen to itself. It's not that hard to cook without meat, and choosing to eat less meat shouldn't result in a form of culinary punishment for diners. We can do better. Change is possible. We are the ones we've been waiting for. So say it with me: "No. The grilled vegetable plate is not acceptable. Do you have pasta? Or pizza? Or salads? Or an employee trained in the art of putting different kinds of foods together on a plate in order to create a satisfying dining experience for customers? Because if not, my party and I will go elsewhere." Come on, vegetarians! We can do it! One of the most frustrating things about New Hampshire is the almost complete lack of decent pizza. I realize I'm somewhat picky about this, but - why is it so hard? There's plenty of good pizza in Connecticut. I'm 150 miles from my parents' house, and apparently something happens in those 150 miles that makes the crust taste like a cracker and the sauce and cheese just . . . bleh. Anyway, I was excited a few weeks ago because I finally found halfway decent pizza at a chain (yes!) called Amato's. I mean, it's not the best pizza ever, but I don't actually complain while eating it, which I'm sure is a nice change of pace for my dinner companions. (Although, really? People who are convinced that Pizza Hut is The Best Thing Ever - you're just asking for it.) Yesterday I was really wanting a calzone, so I figured that since Amato's pizza was okay, maybe their calzones would be too. Yeah, not so much. There was sauce baked into the calzone, which is something they do around here that I just don't understand. Sauce goes on the side! There was no ricotta. And the dough didn't form a nice fluffy pocket enclosing the whole thing. It was just kind of . . . folded over. I mean, okay. The thing tasted fine. It just didn't at all fulfill my calzone craving. I'm going to Connecticut this weekend; there may be a calzone in my future. Otherwise, I'm going to have to just start making them myself. 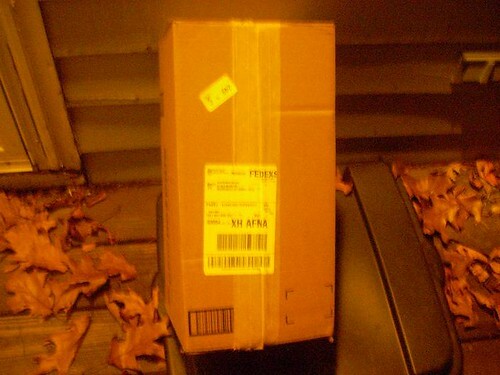 Last night, Megan Carpentier tweeted about wine delivery. I would have almost thought she was joking, but then I thought about it and remembered that Steph Pearl-McPhee mentioned beer delivery the other day. Needless to say, we do not have such things in the wilds of New Hampshire. All I can get delivered is pizza, and maybe Chinese food. But now I'm curious. Can you get exciting things delivered where you are? Can anyone get coffee delivered? (Or lattes, really. I can make coffee easily enough myself.) How about ice cream? I've long wanted there to be something along the lines of an ice cream truck that comes when you call. Let's talk about cupcakes. More specifically, let's talk about cupcake-specific bakeries. I keep hoping that this trend will be over, but it keeps going. Heck, even some doctor on Mercy said that cupcakes were over. But alas. The trendiness persists. My basic problem with them is twofold. First of all, they're expensive. $3-4 for a cupcake? One? Seriously? That's highway robbery. But maybe I wouldn't mind so much if it weren't for the other problem: they're just not good*. I've been disappointed every single time I've had a fancy cupcake-store cupcake. I assume it's something to do with the mass production. If I'm going to spend that much on a single-serving dessert, I'd rather it be an ice cream sundae. But there's a less tangible issue, too. They're just so . . . conspicuous. "Look, I'm spending $3 on a cupcake!" And they're so cutesy, and . . . I don't know. Actually, Sara Mead made this point much better over at the IFA. As she says, "Even the long lines are about the notion that this is something SO special and magical it's worth wasting half an hour of your time to get that box and show you've been at the trendy place." I like her jewelry store comparison, too. I think there's some sort of gender thing going on here too. I mean, sure, guys like cupcakes. But these stores are clearly marketed to women. And the concept of a cupcake implies that it's small. Childlike. Maybe even miniature. (Never mind that some of these stores have ridiculously large cupcakes.) 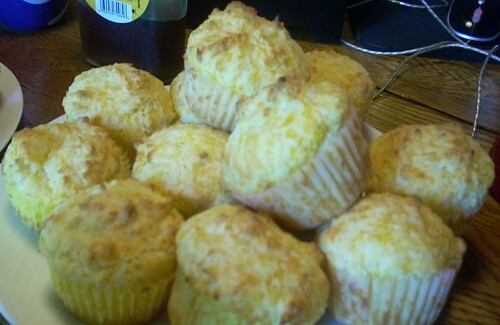 Women aren't supposed to order dessert, but since cupcakes are seen as little and cute and girlish, they're okay. Now I want to do a study: take two groups of women eating at restaurants - on dates, even. Offer half of them a really good slice of cake at the restaurant for dessert, and offer the other half a cupcake at a cupcake store down the road. I wonder if a higher percent would say yes to the cupcake? Hmmm. But I'm getting off track here. The point I was trying to make, before I got distracted by the gender stuff, was that most cupcake store cupcakes are overpriced and taste bad. For the amount of money you'd spend on two of those, say, you could make two dozen yourself that would taste better. Try it! Three cheers for homemade cupcakes! * Caveat: I have a good friend who is talking about starting a cupcake place. 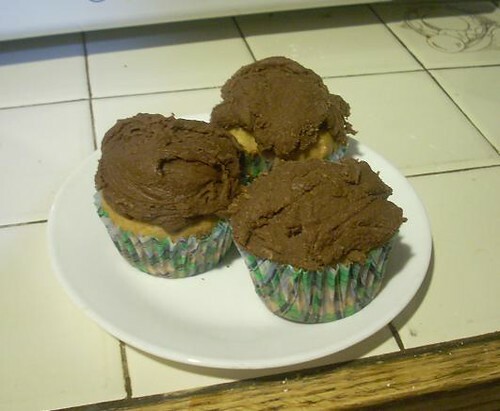 I have had her cupcakes and they are wonderful. Obviously she is the exception to the rule and I am not at all talking about her here. 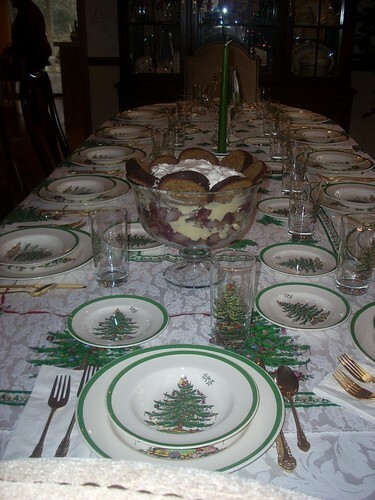 My aunt served this on Christmas, and it just looked like normal broccoli, but then we tasted it and were basically "OMG THIS IS THE BEST THING EVER" and she was all "I KNOW, RIGHT?" Or, you know, something like that. So I made her describe what she did to it, and last night I tried my best to replicate it. Here's what you do! Put a bunch of olive oil in a large saute pan. Add a bag of frozen broccoli florets. (She was very firm in the fact that they had to be florets, not some other cut of broccoli. I'm not sure why it's so important, but I believe her.) You can let them thaw at room temperature for a while, or just add them frozen - it will just take a little longer to cook if they're frozen. Don't microwave them first or anything. Okay, so add the broccoli and a bunch of garlic. My aunt used whole cloves, but I used minced, and it's fine either way. 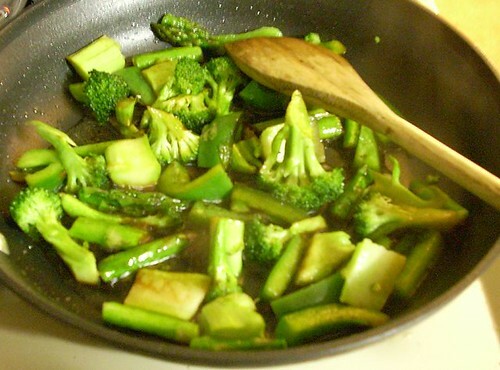 Turn the heat to medium-low and cook, stirring periodically, until the broccoli is almost cooked. 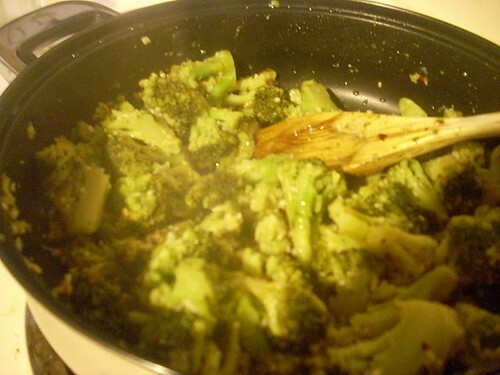 When the broccoli is almost done, add a little more olive oil and some black pepper, red pepper flakes, and sea salt. (Or did she say kosher salt? I'm not sure. I used sea salt because that's what I had.) Stir it a bunch, and keep cooking. You want to almost overcook this. Cook until the bright green has faded and gotten a bit dull. I KNOW. I usually like my broccoli to stay bright green and crisp too. But for this recipe, you really do want to cook it into submission. When the green has faded, turn off the heat and enjoy! It's good hot, room temperature, or cold, so it's great to serve in a buffet or something, or to do ahead when you're having company. Yum. I suddenly remembered this morning that I had promised to bring some sort of baked goods to a meeting today. 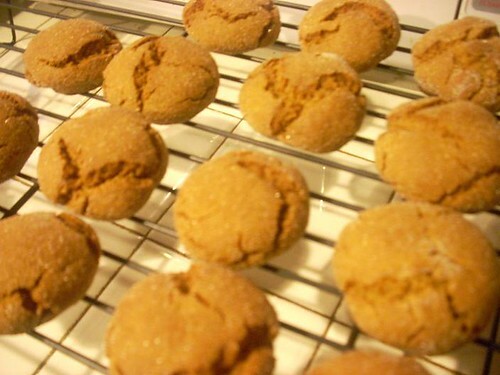 At this point, it was too late for the peanut butter cookies I'd planned, as that dough has to chill and all. So I did what I practically always do when faced with a culinary crisis - I turned to Mark Bittman. 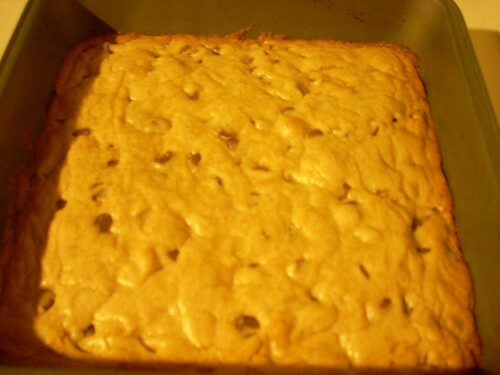 These blondies from his inimitable How To Cook Everything: Simple Recipes for Great Food (seriously, you have this, right? If not, go put it on your Christmas list RIGHT NOW) are quick, easy, and only call for ingredients that I keep around the house anyway. Score. And as I was making them this morning, I noticed that virtually all the ingredients are "one" of something, which means this would be both easy to memorize and simple enough to make at 6am when you're still half asleep. Not that any of us are ever baking in that state. Ahem. Beat it with one cup of brown sugar. Beat in one egg and one teaspoon of vanilla. 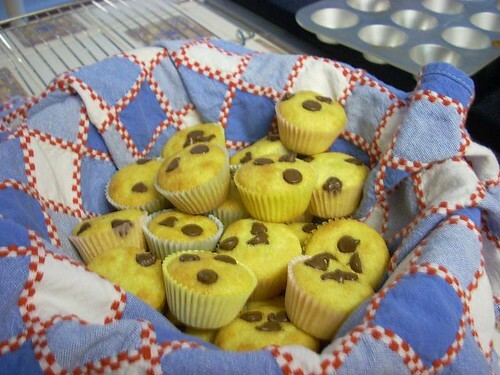 Mix in one cup of chocolate chips, if you want. Or nuts. Or peanut butter chips might be good. Whatever. Go crazy. 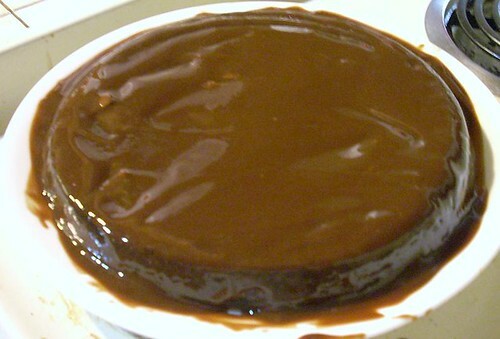 Pour it into the brownie pan and even it out with a spatula. Bake for about 20 minutes, or until "just set in the middle." Cool. Cut up. Bring to work and preserve your reputation as the office baker. I've spent a fair amount of time figuring out where I, a vegetarian, can eat with friends who go gluten-free. And it occurred to me while making plans with a friend this morning that someone may as well benefit from this acquired knowledge. So. The best chain options I've found are Panera - although I'm currently mad at them for getting rid of all vegetarian entree salads - and Uno's. The latter even has gluten-free pizza crust now, although it doesn't actually seem to be the tastiest thing ever. But still. In general, Mexican food works pretty well, and Indian can work too. Don't even bother trying Italian. Any other suggestions, or places to avoid? 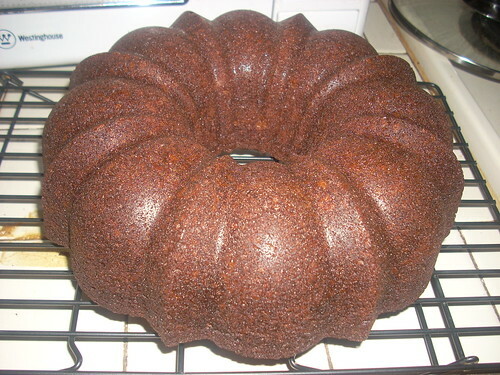 I made this pumpkin bread (from Mark Bittman's How to Cook Everything, which you should all own) at, oh, six o'clock Saturday morning for a party Saturday night. But then I drove to Maine and helped set up tailgating and watched a football game in the freezing cold and tailgated and drove home from Maine and immediately fell asleep. And therefore didn't make it to the party. So! 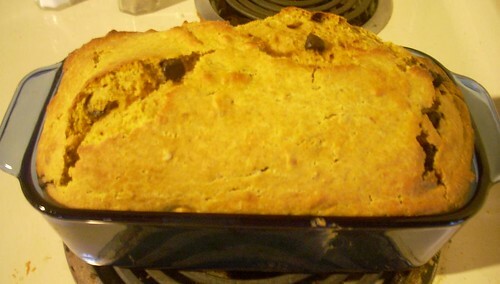 Pumpkin bread, anyone? Yes, I left the peels on, partially because I'm lazy and partially because they taste good that way. A few people have asked for the recipe, but I don't want to share it without permission. 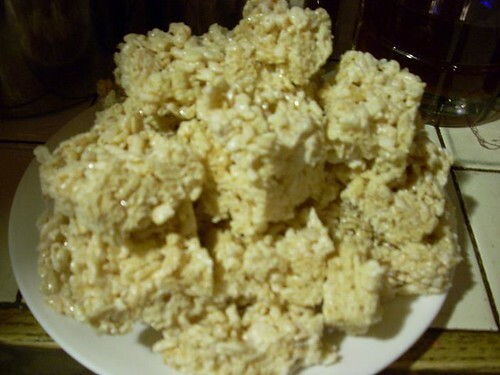 I got it from Beck, and I just found this one on her recipe blog. But it's a little different from the one she sent me. So. I've asked her which version is the preferable one, and I'll let you know what I hear. They're not the prettiest things ever, but boy do they taste good. 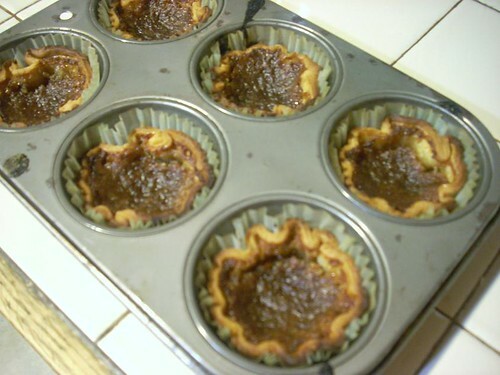 As Rachel pointed out, they're sort of like mini pecan pies without any pecans. I cheated and used prefab pie crust, and it was a bit too thick, so next time I'm going to do it all from scratch. (I was just too tired last night.) And the great thing about them is that they only use ingredients that you'd normally have around the house anyway. (Assuming that, like me, you consider real maple syrup to be a staple. 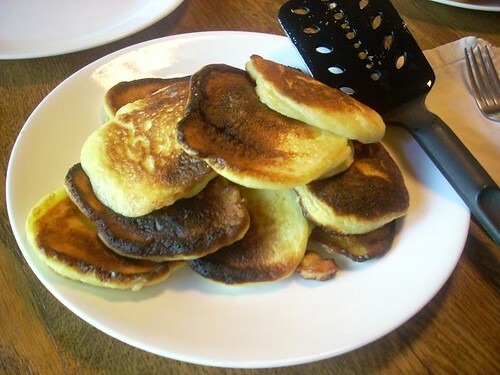 And assuming that, unlike me, you're not mysteriously out of flour and eggs.) I listened to Canadian music (mostly Alanis Morissette) while making them, which I personally believe adds to their authenticity. And now I have something new and different to bring to my family for Canada Day the Fourth of July! What's wrong with guacamole manufacturers? I made quesadillas for some friends last weekend, and I didn't have time to make guacamole that day, so I figured I'd just buy some. Easy enough, right? Well. It was easy enough to buy, but all the brands of guacamole at my grocery store were in plastic pouches or other non-reclosable packaging. Why is this? It has been suggested that the manufacturers are simply trying to make sure that we have to keep buying more guacamole instead of saving one package until we finish it, which makes sense, as far as it goes. But why guacamole? If that's the reasoning, why don't manufacturers use the same reasoning and same packaging for other dips? Anyone have any ideas? I know; the solution to this is just to make the guacamole oneself. Anyone have a favorite recipe? This has been going around the food blogs, but I first saw it at And She Knits Too. Rules: Take the Omnivore's Hundred list from Andrew Wheeler. Bold the things you've tried, cross out the ones you wouldn't try. Note: Since I'm a vegetarian, I'm crossing out all the meat that I didn't try before becoming vegetarian. And in general, you can assume that these answers are for relatively normal circumstances... if I were literally starving and all there was to eat was meat, I'd eat it. 15. Hot dog from a street cart - I'm honestly not sure on this one. 26. Raw Scotch Bonnet pepper (not a whole one, and never again--too hot. They’re good cooked though). 45. Malt whisky from a bottle worth £60/$120 or more - not sure. 58. Beer above 8% ABV - not sure. 63. Kaolin - I don't know what this is. 67. Beignets, churros, elephant ears or funnel cake - I'd say these are all quite different things, but I've had all of them. 77. Hostess Fruit Pie - not sure whether I've had Hostess brand, but I've definitely had this sort of thing. 83. Pocky (or something similar). 88. Flowers - just... any flowers? Yeah. 1. Drain and press a block of firm tofu. Let it sit on paper towels for a little while to get as much water out as possible. 2. Heat up oil (olive, peanut, whatever) in a big skillet. Add garlic and/or onion if desired and cook. 3. Add 2-3 cups of vegetables, cut to be bite-sized. (Above, I've used broccoli, garlic scapes, and a variety of mini summer squash.) Cook them, stirring so they don't stick or burn, until they are a few minutes from ready. If you're using some particularly slow- or quick-cooking vegetables, add them in order of how long they take to cook so they're all ready at once. 4. Crumble in the tofu. Don't worry too much about the size of the pieces - I usually just crumble it in with my hands and use a wooden spoon to break up any too-large pieces. Add spices of your choice. (Above, I've used coriander, curry powder, and ginger... you could use basil and oregano if you have Italian-type vegetables, etc.) Stir it in and cook. Tofu doesn't really change appearance - you just need to make sure it's hot. 5. Remove from heat and toss in some cheese - again, whatever goes with your veggies and spices. (Above, I have crumbled goat cheese.) Add salt and pepper to taste. 6. Serve with rice, potatoes, other grains, pasta... Enjoy! 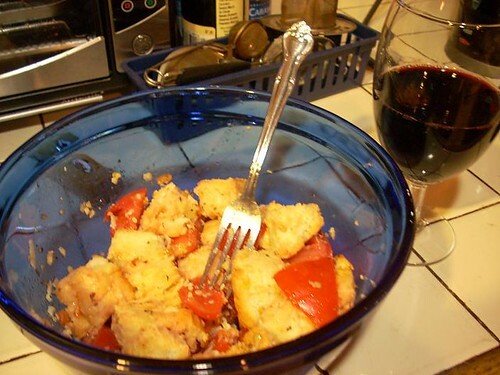 I'd heard about panzanella - bread and tomato salad - from friends, but never tried it before. And then one evening I found myself with some old bread, tomatoes that were almost past ripe, and no time to cook. I looked up a bunch of recipes, but they all wanted me to do weird, time-consuming things like soak the break in ice water (um, ew?) or strain the tomatoes or... etc. So I just gleaned the basic idea and made a really quick version, and it was delicious! And if you have a toaster oven, you don't even need to turn on the real oven - always a plus in the summer. 1. Toast bread, then spread each slice with minced garlic and toast again. Let cool. 2. 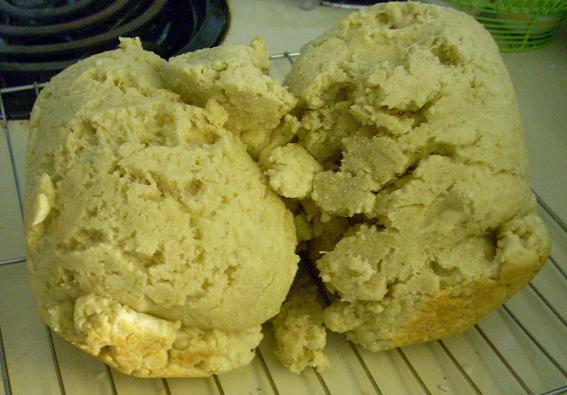 Once the bread is cool, cut it up into roughly bite-sized pieces and put it in a bowl. There will be some crumbs and garlic on your cutting board - scrape those into the bowl too. 3. Cut up the tomatoes into pieces of the same size as the bread and stir them in. 4. Add a tablespoon or so of olive oil - enough to coat everything but not be too oily. Shake in some dried basil (or fresh if you have it) and salt and pepper to taste. Grate on a bunch of romano cheese. 5. Stir it all up and let it sit for 20 minutes or so to let the flavors mesh and saturate the bread. 6. Enjoy with a nice glass of wine! YUM. Tomato, fresh mozzarella, tons of basil, oil and vinegar, all on a multigrain asiago roll, with a pickle on the side. It's like everything I like in the world, all on one plate. Question: What do you do when someone invites you to their house for breakfast, but you get the invitation at 1 am and have to leave for breakfast at 8? Additional complications: you don't know how many people will be there, and you're not in your own kitchen. 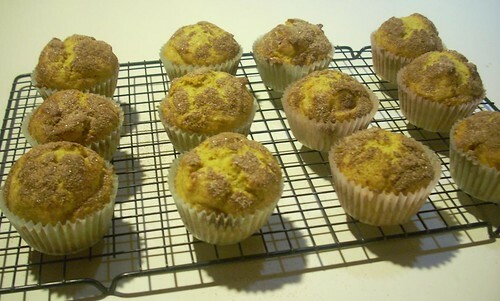 Answer: Make mini muffins, of course! I just found a box of Jiffy corn muffin mix in my mom's pantry and prepared the batter according to the instructions on the box. Instead of making six regular-sized muffins, I make 24 mini muffins, which took care of the "don't know how many people are there" issues. Plus, anything "mini" is automatically cuter and more impressive. Before I put them in the oven, I placed about three chocolate chips on the top of each one, and then baked them at 400 until they were golden brown. Put them in a basket with a brightly colored cloth, and voila! A perfectly respectable breakfast contribution. 1. 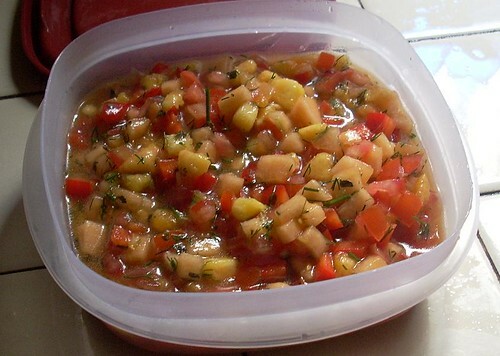 Chop peach, canteloupe, tomato, and pepper into very small, approximately uniform pieces. Dump them all in a mixing bowl and stir. 2. Add lime juice and oil oil, and stir so that all the fruit and veggies are coated. 3. Chop the dill, and add it and the mint. Stir well. 4. Taste, and add salt and pepper as necessary. Enjoy! * This would also probably be great with fresh mint, but my grocery store was all out. I tell her that, according to the ads, it should be "dunked" before eaten. "No, in milk," I reply. "Milk?! A biscuit dipped in milk? Who does that?" I think it will be a yummy Friday at the office tomorrow. * Actually, in case anyone does wish they worked in my department: we're hiring a bunch of people. Leave a comment if you want more info. We're having lovely spring weather in New Hampshire this week, and this morning I was reunited with my favorite warm-weather breakfast: Stonyfield Farm Nonfat French Vanilla Organic Yogurt with a sprinkling of granola and fruit. I really need to start making my own granola, because it's so ridiculously expensive, and really, how hard could it be? Anyone have any favorite recipes? "WE HAVE BEEN CLOSED FOR SEVERAL WEEKS"
Um, what? Does that mean it's open now? Wouldn't it be more useful to say that they will open in several weeks? Or that they are currently closed? Or something? A lovely case of grammatical issues making it unclear what the message is even supposed to be... unless they really are just telling us that they have been closed for several weeks. I think that is in fact true, but I don't see how it helps me know when I'll be able to get some lo mein. 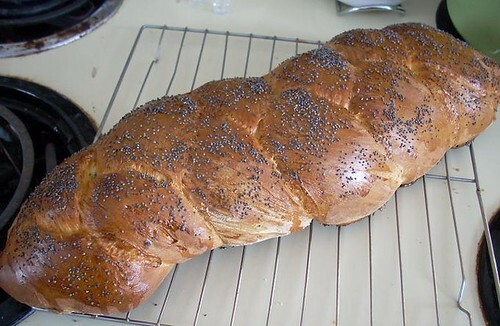 Honestly, I don't know if it's "right" because I've rarely tasted challah before, but it's yummy! 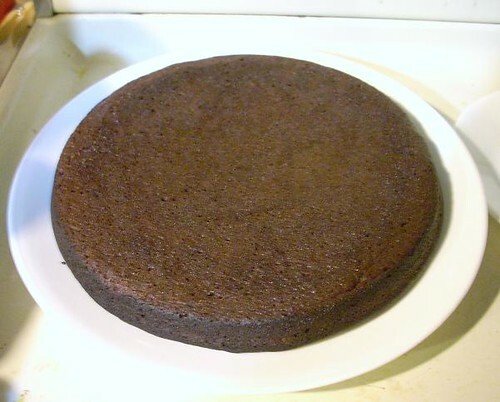 I think the top is a bit browner than it's supposed to be, because I was having oven temperature regulation issues. Overall, though, I think it was quite a successful experiment. Is it me? The machine? The recipes? (I've tried more than one.) Any ideas? It tastes fine, of course, but it's certainly not pretty, and the weird shape isn't very conducive to sandwich-making. I've had a productive day while being snowed in. 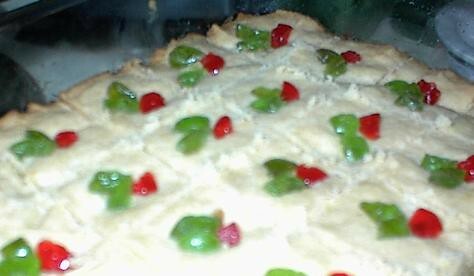 I made four pans of the above shortbread, plus a batch of fudge, so I am officially ahead on my holiday baking schedule. Actually, I'm hoping that by bedtime tonight I'll be ahead on both my baking and knitting schedules. I have a few knitted things to show you over the next few days, and then the rest will have to wait until they've been given at Christmas. 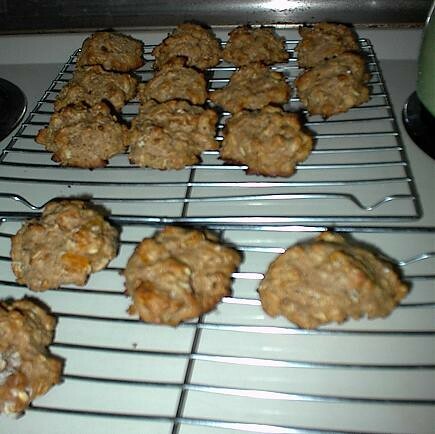 I substituted whole wheat flour for half the regular flour, so that makes them healthy, right? 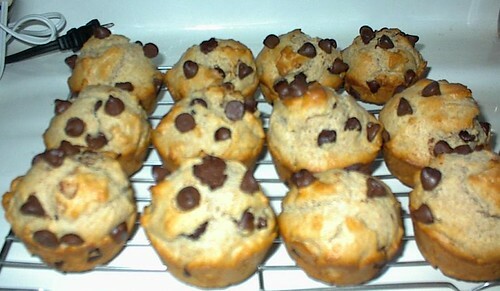 ;-) They're yummy for breakfast with a piece of fruit, some milk, and a big mug of tea. 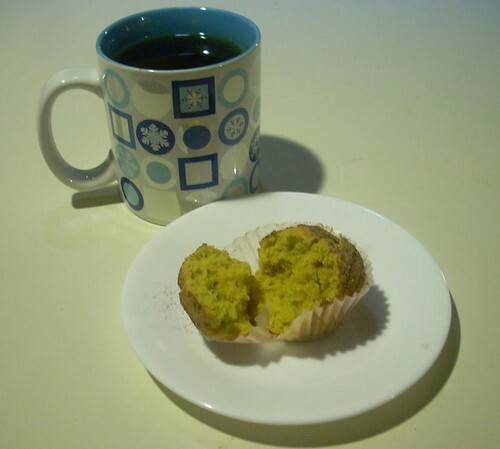 This morning, I had a mug of Celestial Seasonings Nutcracker Sweet Holiday Tea while I was baking and then some Twinings Irish Breakfast Tea with breakfast. I'll admit I "cheated" on these. I usually like to do my baking from scratch, but I do keep a few mixes around for when I'm rushed or need something last-minute, as was the case today. 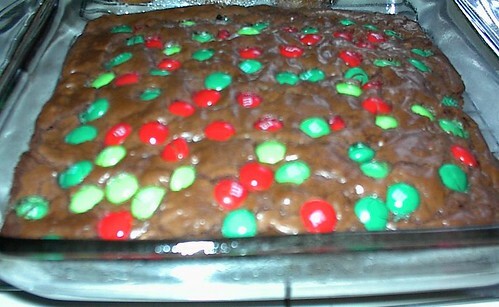 This was a Ghirardelli walnut brownie mix; I just scattered the M&Ms on top before I put them in the oven. 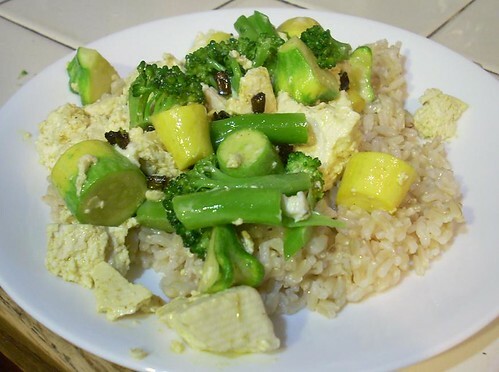 This is adapted from the various baked tofu recipes in a great vegetarian cookbook called Enemy of the Steak. 2. Mix sauce, vinegar, garlic, herbs, and spices. 3. Spread about half of the sauce mixture in the bottom of a shallow baking pan (9x13 or so). 4. Place the tofu in a single layer in the pan. 5. Top with the rest of the sauce mixture. Spread out the sauce so it covers the surface of the tofu - I find it's easiest to do this with a spatula. 6. Optional: Top with grated cheese. 7. Bake, uncovered, for 30 minutes. Serve with salad and the grain of your choice (suggestions: pasta, couscous, risotto), or use as a sandwich filling. I took a little break from homework to do something much less stressful. I made cupcakes! And then I made frosting! This was just a quick dip I threw together to contribute to a dinner with friends the other night, but people really seemed to like it and a few asked for the recipe, so I thought I might as well post it here too. As is my wont, I read a bunch of recipes and combined them. Note: this is written for the crockpot/slow cooker, but if you don't have one, you could probably achieve similar results by simmering in a large heavy stockpot. Put cubed cheese in the slow cooker and pour other ingredients over it. 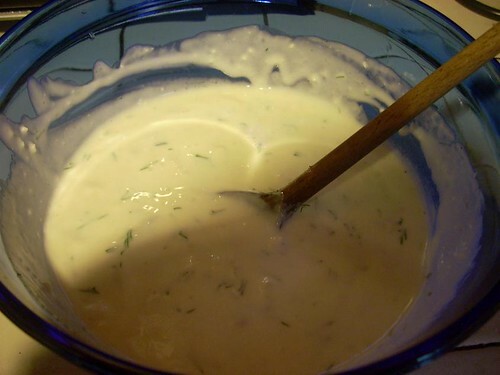 Cook on Low for a few hours, stirring frequently, until the cheese is melted and all ingredients are blended. Serve with corn chips. Super easy, but oh so yummy. I can't be the first one to think of this, but I've never heard it anywhere, so I thought I'd share. I usually have a horrible time chopping onions. I don't just tear up: I sob. I've tried most of the remedies I've heard, and none of them do much. But today I was washing an onion, because it seemed a little dirty, and I decided to cut it down the middle to make sure that the dirt was just on the outside rather than related to some sort of internal rotting or something. And I realized that I wasn't feeling the slightest bit teary. So I went ahead and cut the whole onion up while holding it under the cold running water, and I was totally fine. Sheesh. Why isn't this standard practice? Does it do something horrible to the onion's flavor that I don't know about? This latte and the really, really good mocha I got at Starbucks on Sunday might just tip the balance to making it more often worth my while to go a bit out of my way to get to a Starbucks. Fortunately, or unfortunately, depending on your point of view, there is no Starbucks really convenient to any of my regular commutes. (There are, however, 33 Dunkin' Donuts locations within 20 miles of my house, and I'm not sure whether that even counts those in supermarkets or gas stations.) But I spent a lovely interlude at one of the inconvenient ones this past Sunday morning, with a friend and a New York Times, and I think that will have to be repeated. Oh yeah, that's another reason I like Starbucks - the people working there don't laugh at me for spending $4.50 on a newspaper, because they're charging me almost as much for a cup of coffee. Sigh. Updated to add: And, yes, I feel vaguely guilty about going to Starbucks, or Dunkin' Donuts, for that matter. I do try to patronize independent coffee places when possible, I promise. A bunch of people on Chatty have been talking about caramel apple cider recently, and making me really want some. Alas, I have no convenient Starbucks. I do, however, have a kitchen, and rather a "How hard could it be?" attitude about cooking. (Don't scoff; this attitude led to a pretty successful wedding cake, if I do say so myself.) Most of the recipes I've found used three million spices and/or made fifteen gallons of the stuff. I just wanted one mug. So I decided to wing it. Here's my recipe for Caramel Apple Cider for One, made with ingredients found in your kitchen (or at least mine). 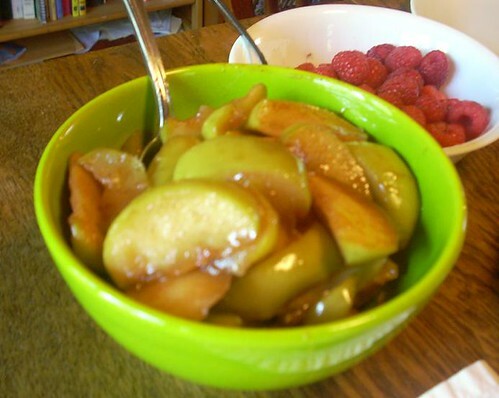 Pour a mugful of generic grocery-store apple cider into a small saucepan. Throw in a one teabag of Cardamon Cinnamon Herbal Tea from Republic of Tea. Turn the heat on low and let it simmer while you do the dishes, clean the bathroom, and sort the junk mail (or, um, for a while). Stir occasionally. When a taste test determines that it is sufficiently hot and spiced, pour it back in the mug and add some caramel syrup - the kind they use in coffee bars, not the kind you put on ice cream - to taste. (Maybe a tablespoon or so?) I used Torani. Da Vinci is another popular brand. Stir. Top with whipped cream and caramel sauce (not syrup, the ice cream kind) if desired. 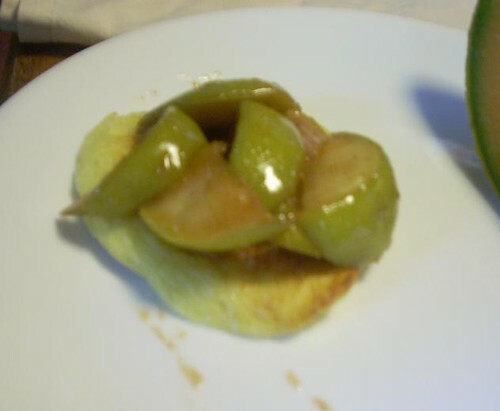 I used Smuckers Sundae Syrup. Enjoy.